This past weekend I tried out my fat tire bike in a 25K (15.5 miles) tour that was part of the Willow Winter Carnival. It is known as the Sven Ericsson Tour. Today 24 bikers, 14 skiers, and four runners tackled the course around some of the finest backcountry trails in the Mat-Su Valley. The course started at the Eaglequest lodge at 10:30 am with a quick sign up and a ten buck entry fee and we were told we could start whenever we were ready. Shortly after the start you made you way to the Willow Swamp Trail. I started off quick but I soon wondered what the heck I got myself into. I had not trained at all for this and this was really the first ride I had done on the fat tire bike I got for Christmas. Just a day before I had some studded tires installed and thought I was ready to hit the trails. Soon I realized that riding a fat tire was sort of like riding a bike in pudding. 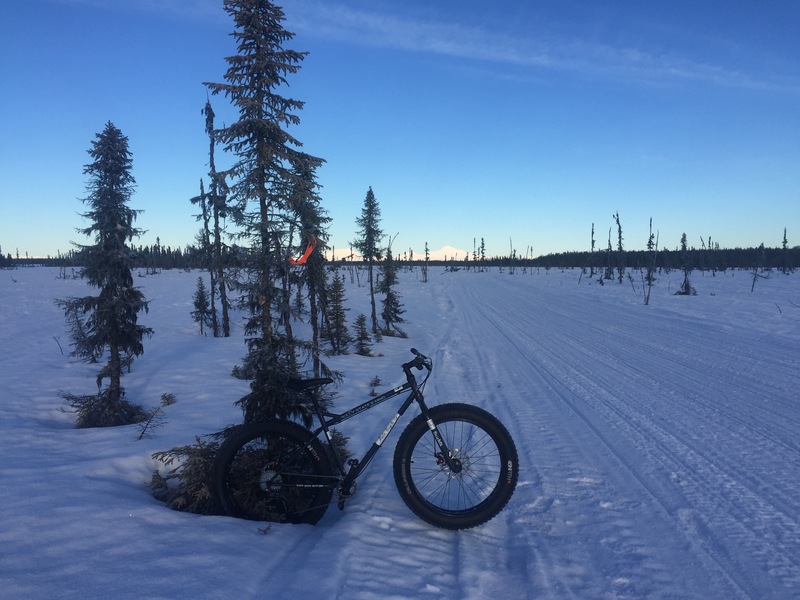 The studded tires do not allow you to coast at all like you would think on a normal bike and the wide tires make the bike pedaling a bit sluggish. Three miles in and I was very winded and soaked to the bone in sweat. Shortly after I dismounted the bike along the side of the trail I was passed by three bikers and a guy on skis. It was a beautiful day with the Alaska range and Denali in all her glory even with my heart pounding in my chest. 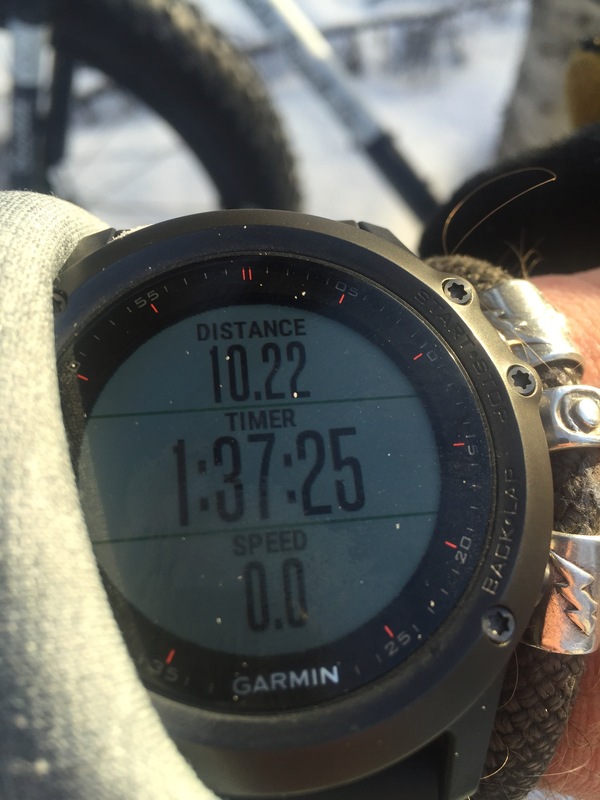 I made up my mind that I would stop every three miles, sort of breaking up the ride in equal 1/5ths and within a couple hours I would finish. The trails were awesome! The Willow Trail Committee does an exceptional job and puts in countless hours making sure they are just right for the dozens of outdoor enthusiasts. Everyone from skiers to dog mushers to bikes to many snow machines making their way to the river and miles of trails beyond. We ran these same trails the weekend before with our dog teams as part of the Earl Norris Memorial Sled Dog Race so I knew what to expect. This is quite possibly one of the hardest things I have done in a long time. I am about halfway done. A couple more bikers passed me commenting the hill will get your heart pumping. Well, at least I wasn’t the only one! I worked my way around Almond Lake, briefly on the Lucky Shot Trail and then onto the Shirley Lake Trail. I was riding along the trails where on one side the Sockeye Fire this summer burned hundreds of acres and on the other were large homes with airplane hangers along a long landing strip. I can only imagine how those homeowners felt with the fire literally burning just a couple hundred feet away. The last three miles or so were a mixture of trails along the swamp, over a couple bridges and then onto the lakes. I knew I was close to the end when we went up a little hill and along a trail that hugged a road. There two more bikers and a skier running with her dog passed me. We all reached Willow Lake at about the same time and finished with in a minute or so together. At the finish Michele, Lacie and Vanessa were there to cheer me home and take a few pictures with their iPhones. I parked my bike along a snowbank and sat for a minute. My legs were like rubber and my behind hurt from the seat but otherwise it was mission accomplished! I headed inside to meet Steve again and collect my much earned patch. It was quite possibly one of the hardest things I have done in a long time but in the end it was worth it. It was a beautiful day and what a way to spend the morning before heading home to watch the Super Bowl. I definitely have a new found respect for those folks that do this as their main “sport.” I was out of my element so to speak. There I was in a pair of Ugg type boots from Cabela’s, a pair of fleece pants and a couple sweatshirts, a knit beanie, and fleece workman-type gloves. In short, I was dressed like a musher while my comrades were dressed in fancy bike and skiing gear. As Michele said, this is why I got this bike. Yep, that’s right, I guess. I don’t know why I punish myself like this. Yes, I do, I am addicted to adventure no matter if I am almost 45 years old, I can still run with the big boys. Well, at least I think I can.